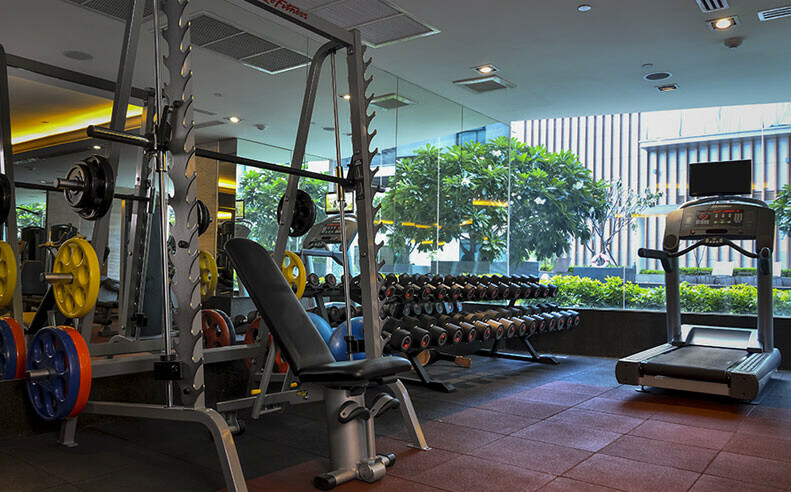 Guests wishing to work out and remain in good shape are invited to use the Fitness Centre facilities located on the 6th floor by the swimming pool and the Spa. The bright, clean and hygienic premises offer a variety of world-class equipment including treadmills, exercise bikes, and dumbbells. The ambience galvanizes you into working out in an enjoyable and beneficial way. A large plasma screen showing variety programs contributes to creating an energetic atmosphere. A session at the Fitness Centre can be complemented by a refreshing splash in the nearby swimming pool where the soothing Jacuzzi sprays will lead to a state of utter bliss. You can also visit the sauna for a complete revitalizing experience. Daily from 6:00 am. – 10:00 pm.